Home Animals What do Turtles Eat According to Their Habitat? Carnivorous, omnivorous or simply herbivorous, turtles have a diverse diet and their eating habits are strongly connected to their habitat. As there are more than 300 species spread all over the world, you can imagine that their feeding preferences vary depending on their type too. The environment they live in, from oceans to deserts, from Eastern woods to Western lakes, though, is by far the most important aspect that influences their feeding behaviour. Many people are considering turtles as pets but their knowledge is limited on their behaviour and needs. So this beckons the question, what do turtles eat? In the following article we will discuss what turtles eat by taking a closer look at species-specific preferences and habitat influences. What do sea turtles feed on? 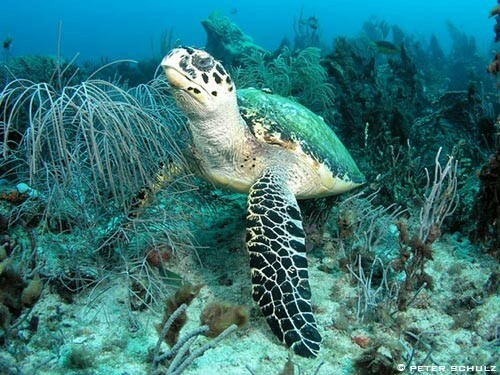 To begin with, sea turtles, which live in every ocean of the world, love soft food. Therefore, their diet consists of soft aquatic life like algae, and includes jellyfish and sponges. Some of them, though, feed on shellfish too, but this has been observed only in the case of turtles with strong jaws. Sea turtles are of seven kinds: leatherback sea turtles, green sea turtles, loggerhead sea turtles, Kemp’s ridley sea turtles, hawksbill sea turtles, flatback sea turtles and olive ridley sea turtles. Among these, there are some pure herbivores. Green sea turtles are the ones which like to munch on veggies. As a fact, leatherback sea turtles eat only jellyfish, while snapping turtles are a species of fresh water turtles which feed on small fish and crickets. Hawksbill sea turtles are a special kind. They are ‘spongivores’, which means their diet is composed mainly by sea sponges. According to the MarineBio Conservation Society, these are quite selective when it comes to their feeding preferences, choosing only certain types of sponges, which otherwise can be toxic to other animals. Apart from this, they also eat comb jellies, algae, mollusks and sea anemones. Sadly, they are a critically endangered species. Another endangered species is the Eastern Mud Turtle which lives in ponds and freshwater habitats. Commonly found in US, species of mud turtles are the greatest in number in Mexico. All of them are carnivorous, preferring fish as a feast. Yellow mud turtles, though, are into a balanced diet, feeding on vegetation as well. Sea turtles are known as the heaviest, some reaching almost 2000 pounds. Alligator turtles are among these. They usually fancy live food, but as they are almost entirely carnivorous, they rely on dead organisms as well. Their diet typically includes fish, but they can also eat snakes, worms, water birds and even other turtles (!). As regards small turtles, there is a species known as the common musk turtle, which is also carnivorous. They eat aquatic invertebrates like worms, and fish. Among the omnivorous species of sea turtles there are the loggerheads. These have incredible powerful jaws, which help them crush their prey. Their diet is one of the most diverse: they eat sponges, corals, sea cucumbers, jellyfish, mollusks, flying fish and even squid. The still waters of ponds, lakes, streams or rivers are preferred by softshell turtles, which feed on fish, insects, crustaceans, and mollusks. Among other river turtles, there are the yellow-spotter turtles. These are omnivorous, eating fruit and weeds aside fish and invertebrates. The painted turtles are worth mentioning as well. Known as the ‘sun turtle’ because they love sun baths, they like to hunt along water bottoms (what a paradox!). They eat both plants and fish, and have nothing against dead animals. Knowing these facts one would be inclined to answer the questions what do turtles eat with everything. But, as you can see, each turtle species has very specific feeding habits. Let’s take a closer look at them. What about terrestrial turtles’ feeding preferences? Changing the habitat, terrestrial turtles are of many types as well. 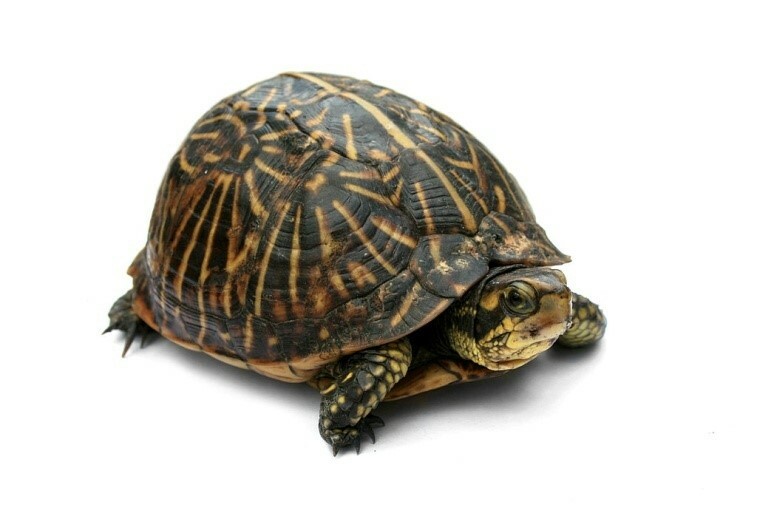 Some of the most commonly known are the ornate turtles, also called box turtles. As regards their feeding preferences, they are the least pretentious turtles. They eat everything from grasses, berries and veggies to insects, caterpillars and earthworms. Among the herbivorous terrestrial scavengers, there are the Gopher turtles too. Their diet consists of a very wide range of greens, from grass to veggies like mushrooms, or fruit such as apples and berries. Aquatic and land turtles can have weird tastes when it comes to food as both types have subspecies that eat carrion (dead fish, decaying matter). Another important criterion for turtles when it comes to eating habits is their age. Leaving the map argument aside, their feeding behavior varies and even changes as they grow up. Adult turtles like to munch on aquatic plants as well as on insects, worms and snails, while young turtles are almost entirely carnivorous, which means that proteins are essential for their growth, just like for humans. What is interesting to notice is that gradually, as they reach maturity, they change their habits. What was once a carnivorous baby turtle, it may become an omnivorous mature one. Their size matters too when it comes to food. 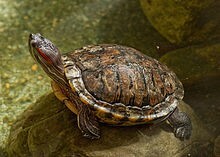 Large turtles are typically carnivorous, but there are also some small freshwater species known as mainly meat eaters. Do you like turtles and consider buying one as a pet? In this case you probably wonder what turtles eat in captivity and how you can treat them depending on their species. First, you can keep freshwater turtles and small terrestrial ones as pets. But you should take notice that captive turtles have different diets according to their species, age and typical environment, just how wild turtles do. So, as previously mentioned, the essential aspect when it comes to a turtle’s feeding behavior is its habitat. The best you can do is to make sure your pet has a proper environment where it can grow beautifully. After buying one it is important to establish its type and age too and feed it accordingly. Are you wondering what do baby turtles eat? Well, baby turtles can be fed every day, while adult ones should be fed only 2 to 3 times a week. As concerns the perfect diet, balance is the key. Try to mix veggies with aquatic vegetation and meat (earthworms and fish). Always ask a specialist. Boxed turtles and painted turtles, for example, have similar diets. They like eating vegetables, fruits and insects. Red-eared slider turtles, on the other hand, known among the most popular pet turtles, like to feed on raw fish and earthworms. Just like babies, your little turtles will need vitamins and calcium for a long and healthy life. You can buy these from pet stores, where you can find a wide range of foods as well. Finally, don’t forget to keep the tank clean. There are many turtles that love to eat under water. We hope that this information answers the question “What do Turtles Eat?”. If you have any further inquiries we suggest that you discuss with your vet.